Eastern equine encephalitis virus is a mosquito-borne alphavirus, first recognized in humans in 1938. It cycles between Culiseta melanura mosquitoes and birds in freshwater swampy areas. Symptoms develop 3-10 days after the bite of an infected mosquito and begin with a sudden onset of fever, general muscle pains, and a headache of increasing severity. Symptoms can become more severe over 1-2 weeks and infected individuals will either recover or show onset of encephalitis characterized by seizures, vomiting and focal neurological deficits. Severe encephalitic cases often suffer from coma or death. People under the age of 15 or over 50 seem to be at greatest risk for severe disease. Approximately 30-45% of people with encephalitis caused by EEEV will die from the disease, making it one of the most serious mosquito-borne diseases in the United States. Of those who recover, many will suffer lasting effects. There is currently no therapeutic treatment for EEE. Current methods consist primarily of symptom treatment and supportive care. A vaccine has been developed and is in use for horses, as the case-fatality in equines is 80-90%. The vaccine has also been used off-label for ratites (ostriches and emus) and camelids (alpacas and llamas). There is currently no vaccine for humans. While the role of non-avian vertebrates in the transmission cycle of EEEV is unclear, a study in 2012 indicated that snakes in the wild may harbor the virus through winter hibernation acting as a bridge to the next season. The virus is capable of infecting mammals, birds, amphibians and reptiles. The virus causes severe illness in humans and horses, although both are considered "dead-end" hosts for the virus, as the viral load is insufficient to be transmitted to mosquitoes, furthering the spread of disease. Aedes spp. or Coquillettidia spp. are the most likely mosquito vectors that pass the virus from birds to humans. In addition to horses, other animals such as ratites (emus and ostriches) and camelids (alpacas and llamas) can also be impacted by Eastern Equine Encephalitis infection. Emus in particular are highly vulnerable to infection and exposure to body fluids (particularly feces, saliva, and blood) from infected birds can lead to additional birds and people to become sick. For individuals in in contact with sick emus, consult with your veterinarian right away and limit contact with the birds. Anyone working with emus that might be infected with Eastern Equine Encephalitis should always use proper personal protective equipment. This includes wearing disposable or washable outerwear, shoe covers, gloves, face shield, and an N95 fit-tested respirator. The virus can be found in the eastern, Gulf and north-central areas of the United States. It is also in regions of Central and South America and the Caribbean. Most activity occurs between May and August but it can be seen throughout the year in Florida. Typically one or two human cases are reported each year in Florida (range 0-5). The state averages over 60 reported cases of equine EEE each year. In years when conditions favor the spread of the EEE, the number of reported equine cases can exceed 200. EEEV is not believed to have the potential to cause a human epidemic in Florida. Eastern Equine Encephalitis is a rare disease that is spread to horses and humans by infected mosquitoes. It is among the most serious of a group of mosquito-borne virus diseases that can affect the central nervous system and cause severe complications and even death. Similar diseases are Western Equine Encephalitis, St. Louis Encephalitis, and LaCrosse Encephalitis. What is the infectious agent that causes Eastern Equine Encephalitis? Eastern Equine Encephalitis is an arbovirus. Arbovirus is short for arthropod-borne virus. Arboviruses are a large group of viruses that are spread by certain invertebrate animals (arthropods), most commonly blood-sucking insects. In the United States, arboviruses are spread mainly by infected mosquitoes. Birds are the source of infection for mosquitoes, which can sometimes transmit the infection to horses, other animals and, in rare cases, people. Where is Eastern Equine Encephalitis found? Eastern Equine Encephalitis is found in North America, Central and South America and the Caribbean. In the United States, most cases have been reported from the eastern seaboard states, the Gulf Coast and some inland Midwestern areas. How do people get Eastern Equine Encephalitis? The Eastern Equine Encephalitis virus has a complex life cycle involving birds and a specific type of mosquito, Culiseta melanura, that lives in marshes and swamps. These mosquitoes feed only on birds; they do not feed on humans and other mammals. In rare cases, however, the virus can escape from its marsh habitat in other mosquitoes that feed on both birds and mammals (including horses and humans). These mosquitoes can transmit the virus to animals and people. After infection, the virus invades the central nervous system, including the spinal cord and brain. In addition to horses, other animals such as ratites (emus and ostriches) and camelids (alpacas and llamas) can also be impacted by Eastern Equine Encephalitis infection. Emus in particular are highly vulnerable to infection and exposure to body fluids (particularly feces, saliva, and blood) from infected birds can lead to additional birds and people to become sick. What are the signs and symptoms of Eastern Equine Encephalitis? Infection can cause a range of illnesses. Most people have no symptoms; others get only a mild flu-like illness with fever, headache and sore throat. For people with infection of the central nervous system, a sudden fever and severe headache can be followed quickly by seizures and coma. About half of these patients die from the disease. Of those who survive, many suffer permanent brain damage and require lifetime institutional care. Symptoms usually appear four to 10 days after the bite of an infected mosquito. How is Eastern Equine Encephalitis diagnosed? Who is at risk for Eastern Equine Encephalitis? People living in or visiting areas where the disease is common. People who work outside or participate in outdoor recreational activities in areas where the disease is common. Eastern Equine Encephalitis occurs mainly in young children and in persons older than age 55. People involved with the care of emus with Eastern Equine Encephalitis virus infection can also be exposed by direct contact with infected birds or their bodily fluids or feces. What complications can result from Eastern Equine Encephalitis? The disease is fatal to about half of those who develop severe symptoms. Of those who survive, many suffer permanent brain damage. What is the treatment for Eastern Equine Encephalitis? There is no specific treatment for Eastern Equine Encephalitis. Antibiotics are not effective against viruses, and no effective anti-viral drugs have been discovered. Patient care centers on treatment of symptoms and complications. How common is Eastern Equine Encephalitis? Eastern Equine Encephalitis is a rare disease. Fewer than five cases are reported in most years. Although small outbreaks of human disease have occurred in the United States, epidemics in horses can be common during the summer and fall. Is Eastern Equine Encephalitis an emerging infectious disease? Yes. Eastern Equine Encephalitis virus was first isolated in the United States in 1933. The risk of exposure has been increasing as people move into previously undeveloped areas where the virus lives. 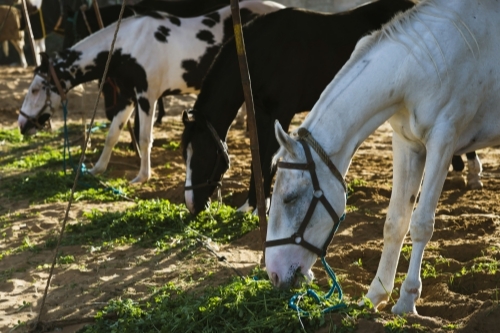 Deaths in horses are a sign of increased spread of the virus in a community. How can Eastern Equine Encephalitis be prevented? A vaccine is available for horses, but not for humans. A vaccine has also been used off-label for ratites (ostriches and emus) and camelids (alpacas and llamas). The best defense against these viruses is prevention. The best preventive measure for residents living in areas infested with mosquitoes is to eliminate the places where the mosquito lays her eggs, primarily artificial containers that hold water. For individuals in in contact with sick emus, consult with your veterinarian right away and limit contact with the birds. Anyone working with emus that might be infected with Eastern Equine Encephalitis should always use proper personal protective equipment. This includes wearing disposable or washable outerwear, shoe covers, gloves, face shield, and an N95 fit-tested respirator. Please contact your county health department for any questions related to emus and Eastern Equine Encephalitis exposure risks. Discarded old tires, drums, bottles, cans, pots and pans, broken appliances and other items that aren't being used. Keep mosquitoes out of your house. Repair broken screening on windows, doors, porches, and patios. For additional information visit http://www.floridahealth.gov/diseases-and-conditions/eastern-equine-encephalitis/index.html. For information from the Centers for Disease Control and Prevention (CDC) visit http://www.cdc.gov/EasternEquineEncephalitis/.